Some boats through no fault of their own seem to attract an aura about themselves. Every time a sail is hoisted, there is something in the air that says: "something interesting/funny/scary/tragic is about to happen". Such a boat was the Ethel. I've no idea how she got into the pickle snapped from the dockside pictured left, but it appears to have happened in 1914. 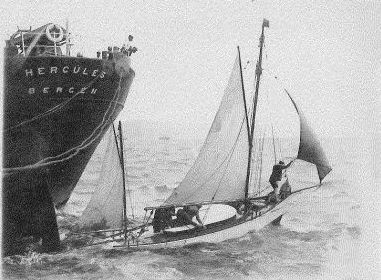 As an aside, the collier Hercules was torpedoed and sunk in 1917. Ethel was built by Charles Bailey Sr. in Auckland and launched 1884. She probably initially had a plumb stem. The clipper bow she shows in these photographs bears the hallmarks of a later adaption. At 33' LOA and 7',8" beam, she was a handy little cruiser, and raced in the 3rd class fleet at Port Nicholson Yacht Club..
Ethel was purchased and brought to Wellington by two young brothers T & Kenneth Cole, in 1909. 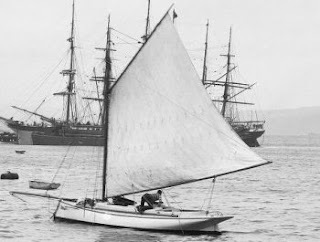 They soon converted her from a cutter rig to a yawl - a fashionable setup for Wellington yachts from about 1900 to 1920 which were intended for a lot of cruising. The image of Ethel (still cutter rigged) here with all of the women on board is a fitting one to this tale. 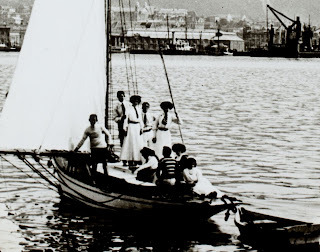 In May 1912 Wellington was scandalised to read in the morning papers that the lads and a couple of friends had, on a Sunday, taken four women unchaperoned out for a sail and picnic on Ward Island. To make matters worse, two of the women were barmaids! Unfortunately, whilst picnicking, a southerly squall came through, followed by driving rain. In trying to get back aboard the Ethel, the dinghy was lost, and the party was stranded. The Ethel was sailed back to Wellington by two of the party to raise the alarm. The castaways were picked up by the Siren (happy name! ), and taken aboard the Naomi, dried and fed. A full article of the events, along with cartoons may be read here. 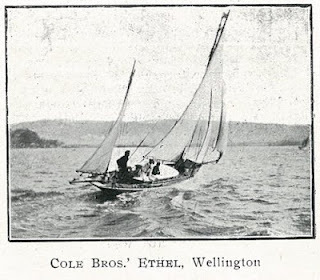 The Cole Brothers sold Ethel in 1914 and joined up. 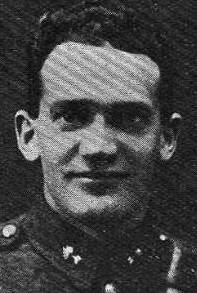 Kenneth, a winner of the Military Medal, in January 1918, was killed at the Somme in April 1918. Ethel changed hands twice during the war period. A great deal of mirth was taken at the expense of her handling - particularly in the Clyde Quay marina, where is was felt positive that she only came in at full tilt, relying on banging against another vessels and eventually the breastworks to bring her to a halt. See here and here. In 1916 Ethel was purchased by an Australian veteran of the war, L. Hill. 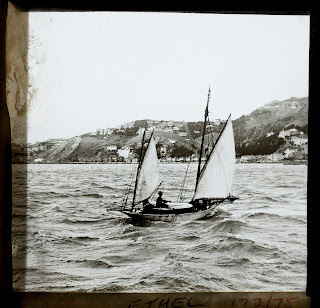 Although a member of the Port Nicholson Yacht Club, Hill was a loner, and only ever sailed Ethel single-handed. He lived at his shed at Clyde Quay, and spent all of his time either in his shed or at sea. In December 1918 he took off for several months to the Marlborough Sounds. In June 1919, he left Port Underwood for the return to Wellington, but after several weeks it was realised he hadn't arrived. Wreckage of a yacht had been spotted North of Wellington at Otaki. 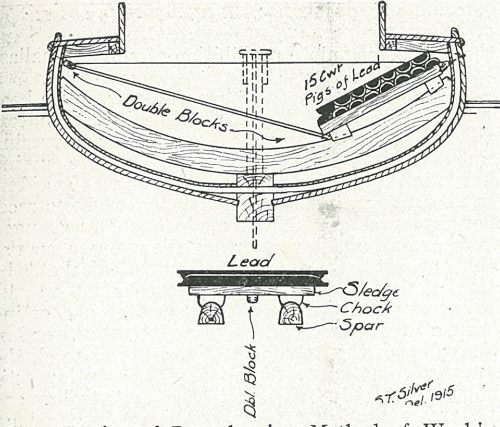 It was worried that Hill was lost until news was received eventually that he had been blown South of the Wellington entrance and had for five days struggled to get Ethel to weather and get inside the channel. Exhausted, dehydrated and starved, he decided to drive Ethel ashore at Palliser. She was a complete wreck. 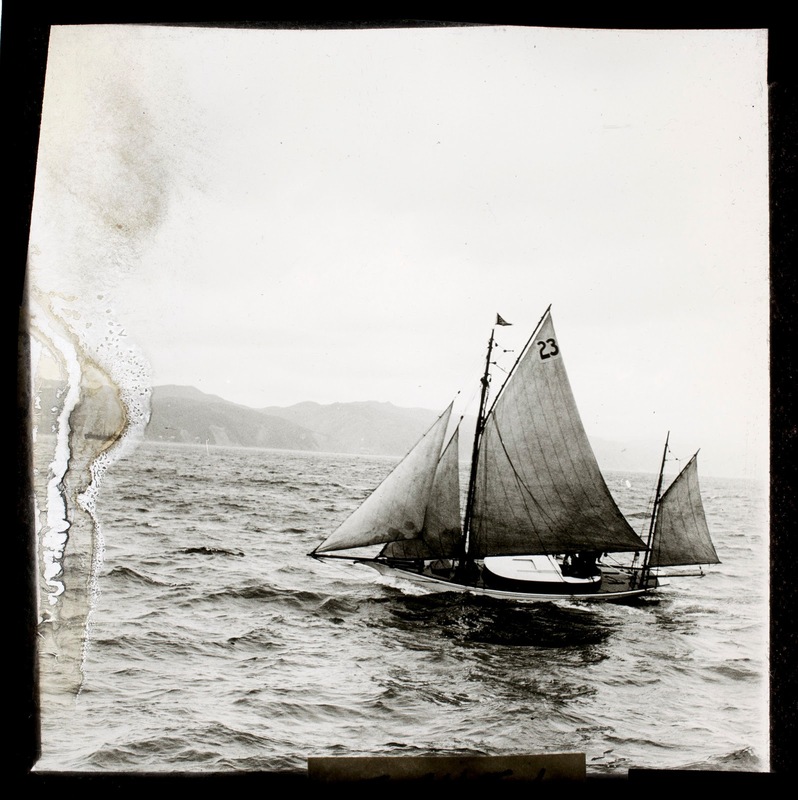 He managed to get ashore and find a farmhouse, where he was fed and looked after for several days before he got a ride on to Featherston. 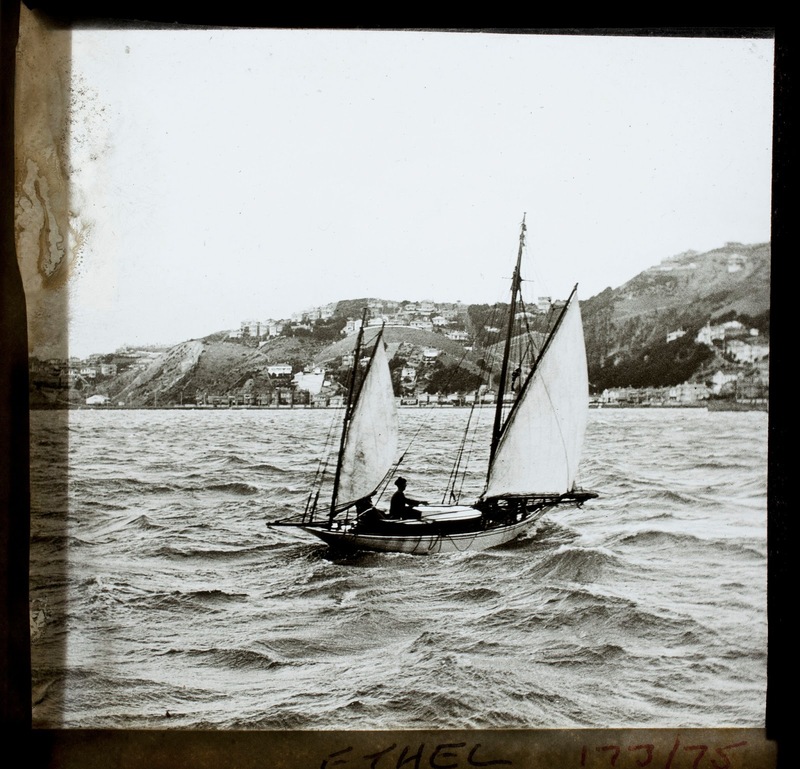 From Featherston, he decided to walk back to Wellington - a matter of more than 60 kilometers. It appears he took his time about it, and odd jobbed here and there before deciding to go to Auckland instead. What happened to him after that is a mystery. There's nothing quite like a blat across Cook Strait. It's always different and there's always a challenge of some kind or another. Lots of people take their boats across from Wellington to spend a holiday. Sitting around and idly fishing or having parties is not really my thing though - not for days on end anyway. I've always preferred the sailing bit. If you're similarly inclined, and find yourself pottering about over there with not much to do, you might want to check the veracity of the story below. It is taken word for word from the Yachtsman magazine - a very good publication put out by the Evans Bay Yacht and Motor Boat Club for several years during the mid 1930s. If nothing else, it provides a nice little fireside read. ﻿﻿﻿﻿There is a Treasure Island in Marlborough Sounds with buried gold to the estimated value of 400 pounds. 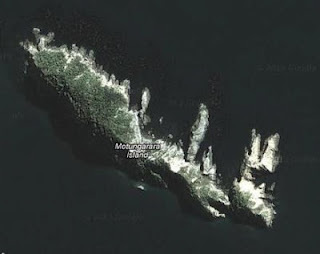 The Island is shown on the charts as Cooper Island and it is situated between Cabbage Bay and Long Island in the Northern entrance. The charts show the island as being without any anchorage or cove, but in this respect they are wrong as I shall show. There seems little doubt but that the treasure still lies where Laurence Crosbee buried it years ago. Chance led me to the discovery which, aided by coincidence led to our search for the gold and to the tragic death of one of the searchers. Christmas (1929) we were anchored off the Twins in the Northern entrance fishing. Nearby, lay a small island, so I rowed across to it. On coming close I discovered a cleft or channel in the cliff face with deep water. This led me into a tiny landlocked bay. The entrance was only fifteen feet wide, and being on the angle could only be distinguished on near approach. The island looked as though it might once have been the crater of a volcano. Now, however, it was overgrown with stunted bush. 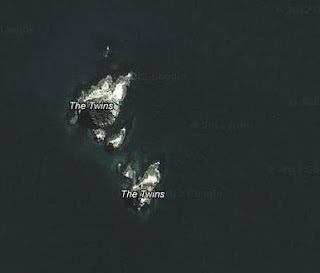 In one corner of the tiny bay was a sandy beach and a few square yards of level land. At the back of this the land rose in sheer cliff to some fifty or sixty feet in height. It was Peter who first mentioned the Treasure, having read about it in "Petersen's Adventures in Marlborough". In 1868, according to this old book (printed in 1875) gold was being mined near the head of Endeavour Inlet. 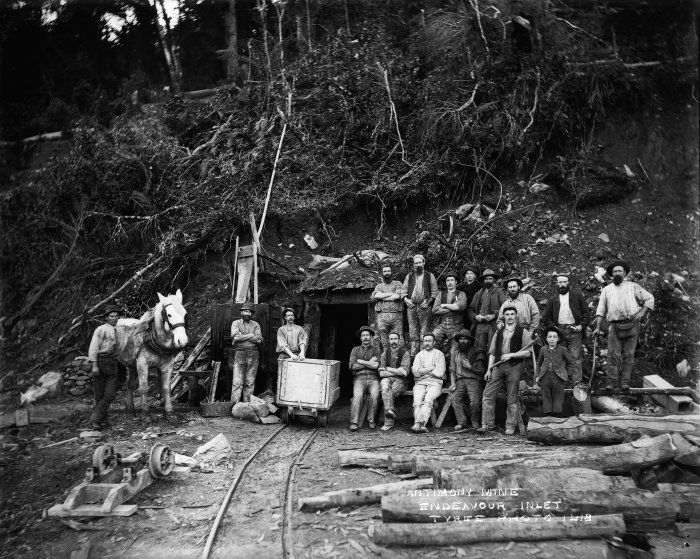 Every few weeks the gold was brought into the tiny hamlet of Endeavour to be taken to Picton. One night a considerable sum lay in the small store and Post Office. It was stolen. There was a great hue and cry and eventually suspicion fell on one "Sailor" Crosby, a ne-er-do-well hanger on who was a boatman during the whaling season. 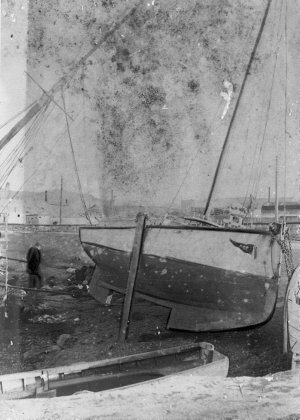 Crosby had a sailboat and was absent for a long time on the night of the robbery. 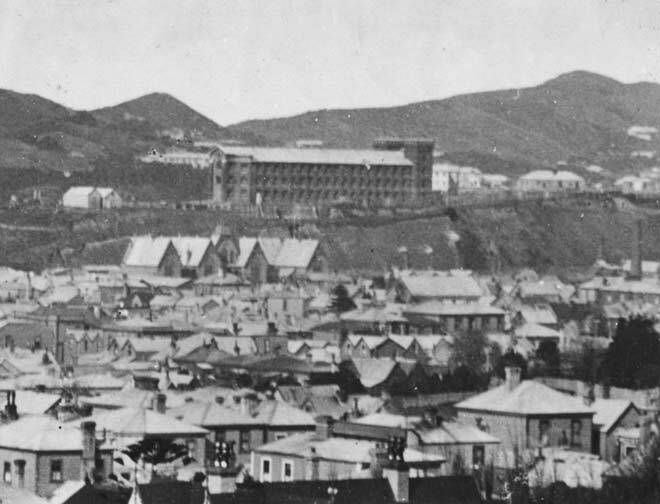 Crosby hotly denied the charge, but was sent to Picton (then capital of Marlborough). He was tried before Mr Justice Grove. 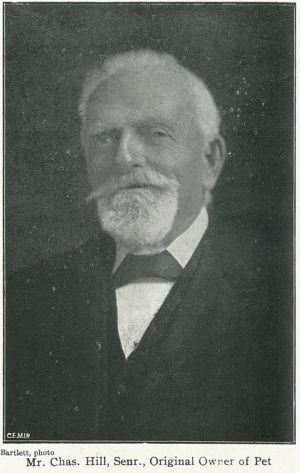 Seeing the case go against him, Crosby tried to obtain a release by promising the Court to return the gold which he said he had buried on an island. The scandalised judge instantly sentenced him to 15 years. Attempts were made for a while to locate the gold but , as far as it is known, without success. As to its correct whereabouts, it was Donald who supplied the final clues. 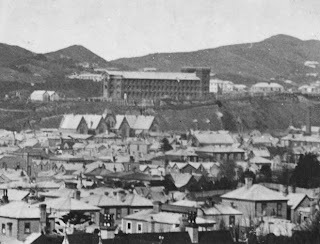 He had been working on the Mount Cook Prison (Wellington) demolition job. During the demolition many strange things were found in those six foot walls. There was scarcely a cell that didn't have its loose bricks with space for hoarding trinkets, letters and diaries. (See Evening Post file for article on these discoveries.) An aquiantance of Donald's, one Richards, working nearby, fished out an old envelope with a letter inside. After glancing at it he tossed it over to Donald remarking that it looked as though a yachtsman had been in the jail. 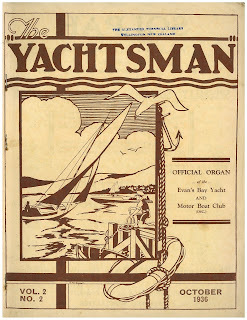 Richards was also a yachting man. Donald looked at the paper which consisted of a letter with a plan on the back. On reading it through later he found that the actual letter had no reference to the chart on the back, which was just the map of an island. Knowing Peter was keen on anything unusual Donald gave him the letter. The letter was addressed to Laurence Crosbee. It is unnecessary to tell at length how we eventually stumbled on to the fact that Laurence Crosbee, the prisoner in Mt. 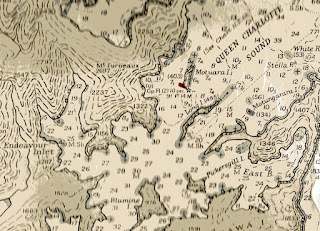 Cook, was the "Sailor" Crosby who buried 400 pounds in gold, and how it dawned on me that the map on the back of the letter was really a chart of Cooper Island. Sufficient to say we came to the conclusion that the gold was on Cooper Island buried five feet on the beachside of a large cabbage tree. Unfortunately others became aware of our discovery. Poor Crosbee must have drawn the sketch to aid his failing memory and then died in jail. We were able to get away on an evening in February 1931, for the Sounds, Donald, Peter, and myself, in the yawl belonging to Peter. 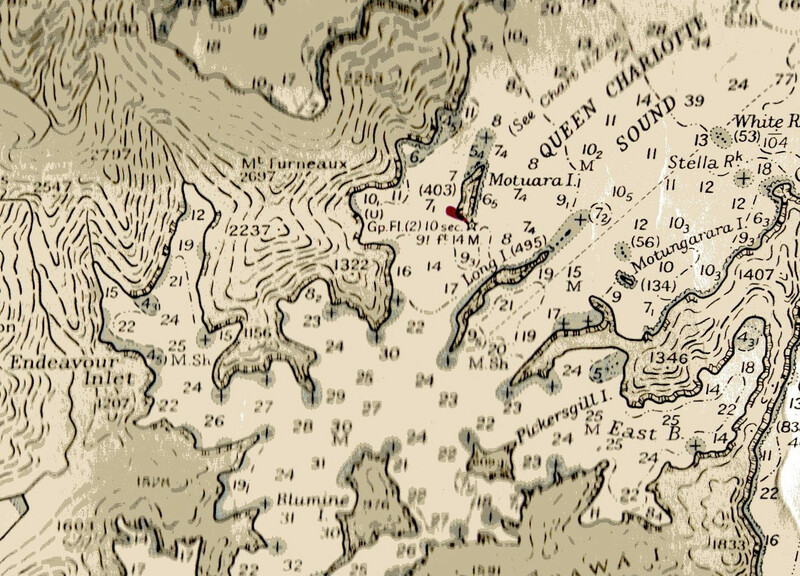 We had a splendid run in the S. E. breeze across the Straits, and reached the Nortern entrance about 6a.m. We took about two hours in the falling breeze to back up to Cooper Island against the tide. When we reached the island the wind had fallen away altogether and we had to tow the yacht into the entrance. The bay was just as I had seen it several years before. the high bush-clad cliffs, the tiny beach - and there, just back from the beach on a small plot of level land was Laurence Crosbee's cabbage tree. As quickly as we could we moored the yacht, furled sails, and without waiting for breakfast we tumbled ashore armed with a pick and a spade. We estimated five feet from the palm and dug. It was hard work, for the sun was hot. We had dug about a foot when we heard the beat of a motorboat engine and suddenly through the entrance nosed a large boat. We recognised the launch. It belonged to Joe Foster and Spud Laws (not their real names of course). We paused from our work as she came in. Standing for'ard to drop the anchor we saw Richards, the fellow who gave Donald the chart. Soon they were ashore looking at the hole we had started to dig. ﻿﻿﻿﻿"Just in time," said Laws with a laugh. Peter asked him what he meant, whereupon Foster said that they had come for their share of the gold as it was just as much theirs as ours. Furthermore they had waited for us in a nearby cove giving us time to start digging in order to see exactly where the gold lay. They wanted to be fair and were willing to split fifty fifty. Peter said he'd see them in hell first and with that the fight was started. The fight was long and tough and in the end Foster and his two pals drew off to nurse their bruises. We were not unhurt ourselves and sat down alongside our hole to glower at our rivals. After resting Laws came up and said that they weren't going to budge until they had got a share. We told him to go to blazes and started digging. The time was now about eleven thirty. Suddenly we heard a crashing sound and a loarge boulder flew past Donald who was loosening the soil with the pick. We looked up the clif and saw Peter on top. "Keep clear of that hole or else I'll roll some bigger bricks down," he yelled. With that he rolled a few more down to show us how. We felt wild, especially when we saw the grins (somewhat twisted) of Richards and Laws. ﻿﻿﻿﻿At this moment fate took a hand and the tragedy happened. The bounding boulders must have loosened the cliff for, with a roar that made the ground tremble, the side came down in a cloud of dust. A large stone caught me in the back as I turned to fly and knocked me into the water. Peter and Donald were to one side and were able to dodge away. Laws and Richards at the other end of the beach were safe. But Foster we found half buried in the land-slide - dead. The tragedy sobered us. More earth was falling, so we returned with poor Foster's body to our craft in the launch's dinghy. Our dinghy was under the earth. We hurried to Picton: the launch with the yacht in tow. On arrival we heard of the terrible earthquake that had happened in Napier at the same time as the landslide. We did not know until then that an earthquake had happened. Among the large toll of death of earthquake victims the inquest on poor Foster passed unremarked especially as we did not refer to the treasure. So the gold still lies on Cooper Island buried deeper than Laurence Crosbee ever dreamed it would be. ...And that's the article in full, including the footnote. Anyone fancy a treasure hunt?? 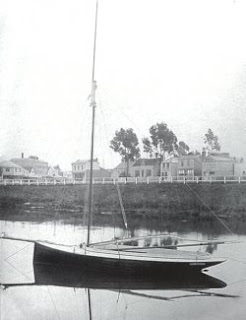 Pet was built by Charles Bailey in Auckland, and was launched in 1877. She was of an unusual shape - in an era of slab-sided vessels and plumb stems, she had quite a pronounced tumble-home and a ram bow. This made her both longer and wider at the waterline than at deck level. 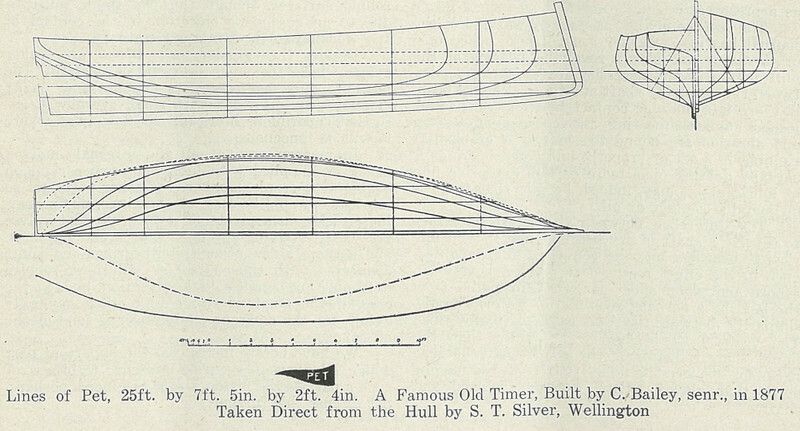 This construction was to cheat a class racing rule of the day which was based on measuring the beam and length of a boat at deck level - a smart little trick to make the boat bigger where it matters and therefore have a faster theoretical (and practical) maximum hull speed. Needless to say, like all other rule cheaters, it didn't take long before a new system was arrived at in the eternal tussle between the designer and class handicappers. 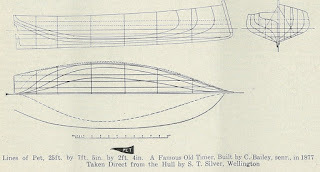 Bailey laid the keel and framed up the boat "on spec", and the structure hung in the rafters of his workshop for some time before being purchased. She was unnamed, and become known in the yachting fraternity as "Bailey's Pet". The nickname stuck when she was purchased by Charles Hill in 1877. 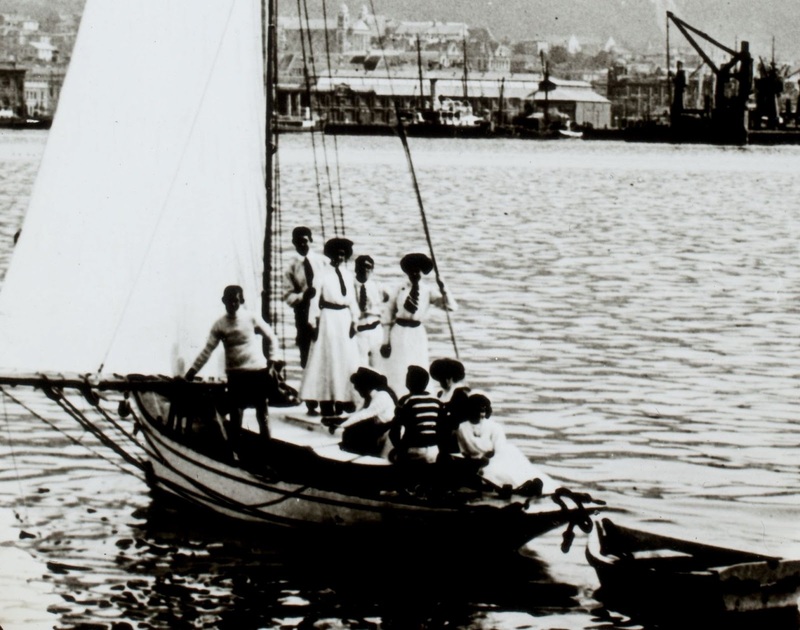 Hill was a hatter by trade, and was one of the founding members of the Port Nicholson Yacht Club in 1883. Hill had Bailey plank her up, and fitted out as an open centreboarder, and after a couple of races in Auckland, brought her to Wellington, where she easily beat her competition. 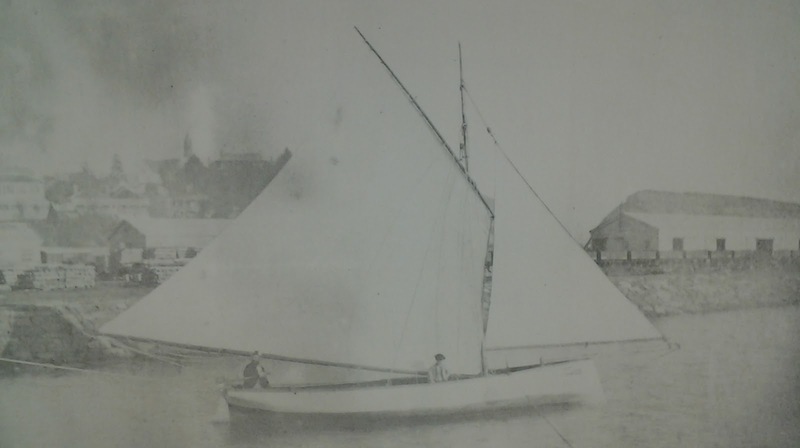 In 1879 Charles Bailey arrived from Auckland with his recent build Toy, a lightly built open boat of cedar with a clear finish, and sporting the latest in light wire rigging. Toy won the second class race of the annual Wellington regatta. Hill took advantage of Bailey's presence to do some work on Pet - having her half-decked over, and a small counter added. Pet was entered in the first class race but had to withdraw when her rigging failed. 1880 was a big year for Pet, and secured her fame as the classiest racer in town. 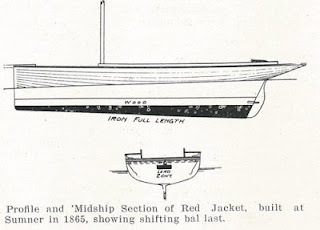 She was entered in the Anniversary Regatta for second class vessels, which was greatly anticipated for the clash with Red Jacket, built in Sumner about 1865. The race was postponed due to rough weather. 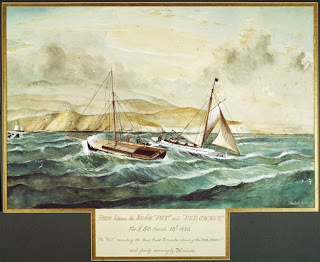 A week later, Pet led the fleet, Red Jacket 50 yards behind, when the wind died away and the race postponed once more. The next attempt was got away in rough weather, and one of the mark buoys came adrift. It was once again a "no race". However, the Regatta Committee in a surprise move, decided to award the prize to Pet, as it felt she was the better performer. Furthermore, the Committee decided to run another race to decide second place! The owners and crew of the Red Jacket of course would not abide this, and laid down a one-on-one challenge in the newspapers. The Regatta race for second place took place, with Pet, although banned from entering, also going around the course. Red Jacket crossed well ahead of the fleet, including Pet. Hill may have been up to some clever gamesmanship here, but there was no denying now that nothing would be settled until a one-on-one private race was sailed. 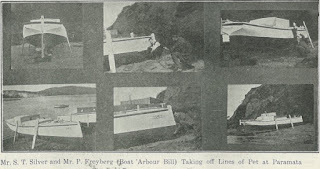 Terms were agreed, and the race was to be around a moored mark boat at the head of Barret's Reef at Wellington Heads, around Somes Island and back to Queen's Wharf. The event was much discussed in the local newspapers, and a great deal of money was laid out in the pubs - mostly at even money. Pet won, and won easily. She was five minutes ahead at the mark boat, and won by 30 minutes, Red Jacket having to bail hard after starting her garboard planks on the beat up the channel in rough seas. Later that year, Pet was shipped across to Nelson for a challenge race against the brand new yacht Isca. She also won that easily; The proud new owner of the expensive Isca so disgusted he never bothered racing again, and sold his boat. (Read Isca's story here). Pet remained the cream of the fleet until the arrival to Wellington of Robert Logan's Jessie Logan in about 1890. Luckily for Pet's racing career in Wellington, Jessie Logan was purchased and spent the next 15 years in Nelson, before suffering the indignity so common in those days of being converted to a launch. Pet had a well-known, though somewhat secret internal ballast system when she was a centreboarder (see the ballast systems of Pet and Red Jacket below). 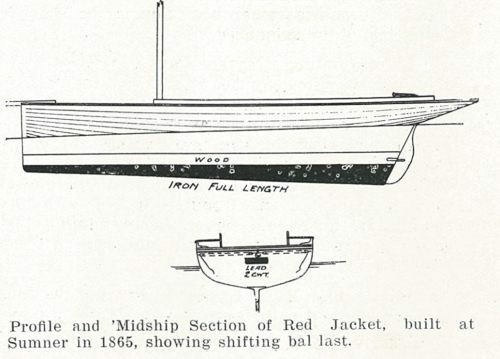 To stiffen her up and make her better fit for regular club racing, deadwood was added to her keel and external lead ballast attached some time around 1888. 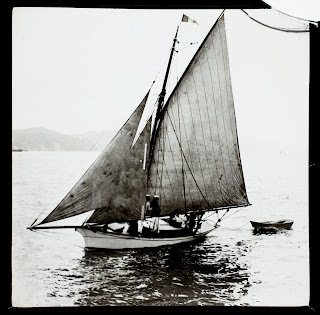 Around 1900 Pet was retired as a racer, and converted for use as a fishing smack at Warehou Bay north of Wellington, She was then converted to a motor launch and used for fishing a little further North at Paremata. She was wrecked while pursuing this work during the 1930s.